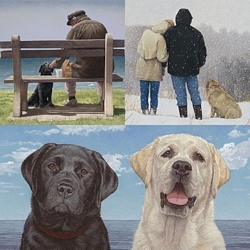 Image Size: 18"w x 11"h.
Weiss has displayed his affection for the breed through several Greenwich Workshop Fine Art Editions including "A Feeling of Warmth," "Let’s Play" and "Best Loved Breeds: Golden Retriever." “Artistically, my goal was to capture the beautiful golden puppy coat with the use of oil paint. I also wanted to set up some interaction between the puppies, each with a unique expression and personality. “In my estimation, the Golden Retriever is one of the most beautiful of the sporting breeds,” says noted canine portrait artist John Weiss. “Not only are they known for their beauty, but also for their intelligence and wonderful temperament. These puppies are no exception, being bred from a very fine line of champions and their future looks very rosy.” Make someone else’s future rosy with a gift of this darling trio.